Native to Brazil’s Amazon rain forest, cashew trees bear copious amounts of a false fruit called a cashew apple. Botanically, the nut we consume is a drupe or a stone fruit with a hard outer shell enclosing the edible kernel. Cashews spread throughout the world thanks to Indian and Portuguese explorers and is enjoyed both as a sweet snack and in the preparation of curries and other dishes. They provide a host of valuable nutrients, vitamins and minerals that make them a great choice in a healthy diet. Particularly abundant is copper which is necessary for the production of hemoglobin, elastin and collagen and offer protection to nerve fibers. There are .6mg of copper in a one ounce serving of roasted cashews, around 30% of the recommended daily intake. They also offer magnesium, phosphorus, manganese, zinc, potassium, selenium and calcium. 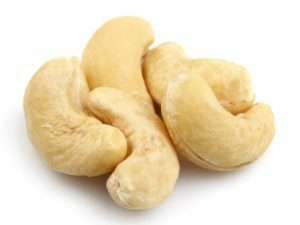 Cashews sometimes get a bad rap for being high in fat. However, the fats contained within are essential, monounsaturated fatty acids which actually assist the body in lowering harmful LDL-cholesterol and increasing the good HDL cholesterol. Diets which include monounsaturated fatty acids help to prevent stroke and coronary artery disease. Vitamin K, needed for proper blood clotting and preventing excessive bleeding, is also abundant in cashews. As is vitamin B6 which helps maintain a healthy nervous system, boost mood,balance blood sugar levels and acts as a natural pain reliever. There are also antioxidant compounds in the nut, including proanthocyanidins which are being researched for their ability to stop the growth of certain cancer cells by preventing them from dividing. Cashews are of particular interest to researchers in the study of colon cancer. The cashew and other nuts have also been researched for their ability to lower the risk of gallstones. The Nurses’ Health study collected dietary data on 80,000 women over a twenty year period and concluded that women who eat at least one ounce of nuts or nut butter each week have a 25% lower risk of developing gallstones. Other than grabbing a handful as a snack or throwing some into a granola mix, there are plenty of delicious ways to incorporate cashews into your meal planning. Below are some links to delicious recipes that include cashews!